IM Padmini Rout (L) seems to scan what WIM Nandhidhaa (L) might play. 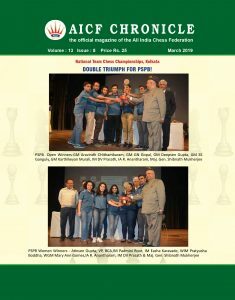 Report by I.A Vijayaraghavan V.
By far the best game on all aspects, was the battle between joint leaders IM Padmini Rout of PSPB and WIM Pv Nandhidhaa of TN. The latter enjoyed a small advantage right from the opening into the middle game from the white side of Sicilian Kan. Padmini was on toes all the time and had created a passer pawn, in spite of central passed pawns of her opponent, which seemed deadly. Padmini played the endgame immaculately, to regain her sole lead that too one point ahead. Air India’s Bhakti Kulkarni enhanced her to catch up with leaders by beating WIM Sakshi Chitlange of Maharashtra. The Panov Botvinnik attack in Caro Kann helped Bhakti to create passer on the queen bishop file. She combined her 2 bishops alongwith to press home with a point and she moves on 4 points. Newcomer Samriddha Ghosh played a flawless game to beat WGM Kiran Manisha from the black side of advance French variation in 31 moves. In the middle game the junior player sacrificed a knight to expose white’s king, which was not supposed to be captured. Samriddha manoeuvred her queen to strong squares to win a pawn. Interestingly her last move was castling connecting the rooks and bring down the white’s position when Kiran Manisha resigned. LIC’s Swati Ghate took her time to beat the tailender Srishti Pandey of Maharashtra in 49 moves of the Sicilian Kan. Swati’s rooks controlled the king file and converted into a point in the king and pawn endgame. 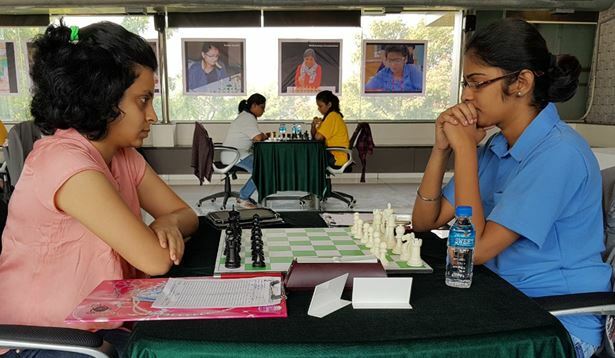 Unperturbed by the previous day happenings former World Junior Champion WGM Soumya Swaminathan beat Air India’s WGM Meenakshi Subbaraman in 49 moves. Soumya equalized early in the opening and was busy countering the queen side passer pawn of white. Around the 40th move Meenakshi made a tactical error in bank rank allowing Soumya to pounce upon and win. The last and the longest game belonged to WGM Mary Ann of PSPB and Bala Kannamma of TN. Mary built up an clear advantage only to lose it towards the endgame, despite being a piece up. The resultant Rook+pawn vs Rook+knight was less interesting, but former Commonwealth Silver medallist tried to trick her opponent only to split the point in 107 moves. Tomorrow (1st Dec) is a rest day and the organizers are planning to take the competitors to a diamond factory and a big textile mart which are famous in Surat.